PhD in Management – tua.edu.au/Management_PhD – Study Online at Torrens University. Request Information Right Now! Our retirement nest eggs: Time to go fossil free! As the managers of our retirement nest-eggs, superannuation funds should be investing in the companies of the future. Sadly, most aren’t. In fact, 55% of the world’s pension money is invested in climate-exposed industries, while less than 2% is invested in clean energy. The good news is that all of this money belongs to individuals like you and me. If each of us agitates our super funds to change or moves to a fossil free fund, think of the money we could leverage for climate solutions! In 2014, we’ll be supporting you to do just that – ramping up our pressure on Australia’s superannuation funds to stop investing in climate destruction and start investing in climate solutions. This will include a tool to help you rank your fund’s exposure to fossil fuels and pressure them to change or switch to a cleaner fund. Watch and share this short informational video we made to learn more. With 435,000 members spread across 37 universities, UniSuper has more than 3 times the shareholdings of Australia’s universities combined, with over $1 billion invested in the fossil fuel industry. UniSuper’s top investments including some of the world’s largest fossil fuel companies, whose activities will turn the Great Barrier Reef into a dumping ground, forests into coal mines and the climate into a disaster zone. If you’re with UniSuper, click here to take action today! If that wasn’t troubling enough, most university employees can’t choose their super fund – they’re stuck with UniSuper. 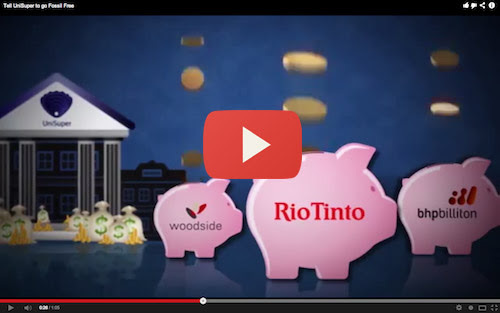 Although UniSuper offers a “socially responsible” option, it includes the same companies (including BHP, Woodside Petroleum and Rio Tinto) as their default option and their environmental fund is a high-risk option which invests exclusively in foreign-owned companies. So much for choice! We believe that everyone deserves to know and choose where their super is invested. We also believe that, as the stewards of our nest-eggs, superannuation funds like UniSuper should be investing in the companies of the future not companies whose business models assume climate change isn’t happening. And if you’re also a UniSuper member, click here to tell UniSuper that it’s time to go fossil free. Not a UniSuper member? Stay tuned for our super fund rating tool and action platform, which our elves are busily working on as we speak!